Jelly has never looked this enticing. 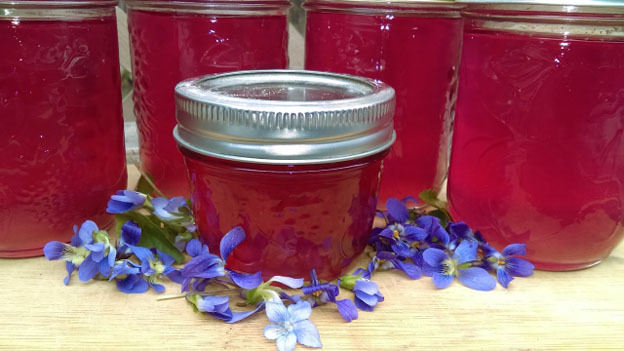 Wild violet jelly not only tastes amazing on toast or crackers, it looks, and is, incredibly delicious. Place flowers into a bowl. Pour boiling water into the bowl until full (minimum 4 cups water). Stir to release air bubbles. Cover the bowl and keep it out of bright light for 24 hours. Line a colander with cheesecloth or a coffee filter and strain. The liquid will be dark sapphire blue. In a pan, mix 3 ½ cups of the violet liquid and lemon juice then bring to a boil and let boil one minute. Add sugar and pectin then bring back to a hard boil – then let boil one minute. Remove from heat and skim the top is needed. Place into sterilized mason jars, seal, and process in boiling water. The final colour of the jelly will be fuschia.